Project obstacles and solutions: The U.S. 31 reconstruction project in Indianapolis is the latest to rebuild the highway as a free flowing thoroughfare from Indianapolis to South Bend. This has closed or required an overpass for crossing streets and roads intersecting U.S. 31, a main north and south artery to the state's largest city. The stretch of highway between I-465 and 136st Street in Indianapolis includes eleven bridges with entry and exit ramps. These bridges were critical to the completion of the highway, as they were needed to keep access to residents and businesses open while the highway was closed. Keeping at or ahead of schedule was crucial to construction traffic patterns in the heavily traveled area. Halverson Construction built the bridges and CRI built the moment slabs and barrier walls that were part of the overpasses. E&B paved the sidewalks and curbs as well as the pavement on the new streets. Crews worked around the clock to keep the project moving forward. IMI supplied concrete for all of the contractors working on the bridges. One key to keeping the project on schedule was night pours of the decks during the summer months. This served two purposes. One, traffic was reduced at night so concrete trucks were unimpeded to the job site. But the other had to do with the curing of the decks. Halverson Construction wet cured the concrete. It was covered with Burlene and then sealed after seven days. Pouring the concrete at night allowed Halverson to pour, tine, and get the concrete covered before the sun came up and began to dry out the surface, avoiding plastic shrinkage cracking. The moment slabs were also key to stabilizing the outside walls by tying the entrance and exit ramp structure to the bridge rails. This is particularly important when you are building roads with non structural materials such as asphalt. 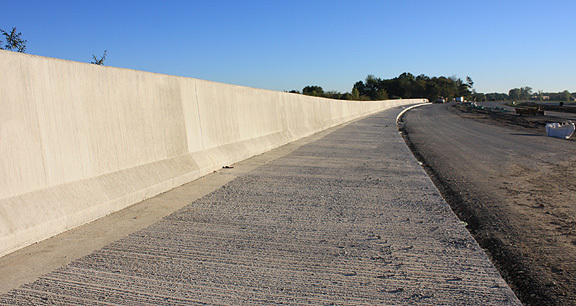 IMI supplied CRI with low slump concrete designed specifically for reinforced wall construction. To date, IMI has supplied 23,000 yards of concrete for the U.S. 31 project.